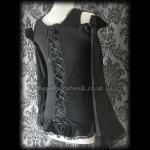 An unusual gothic punk top made from black cotton with a lace covered bust area and a small corset ribbon laced section at the neckline. 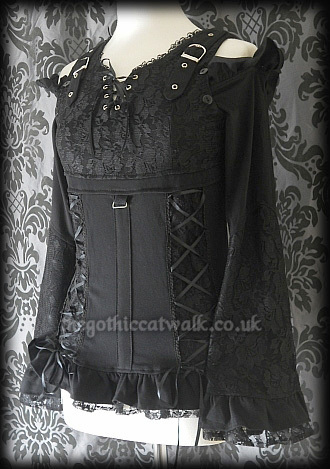 The shoulder straps are comprised of soft cotton adjustable buckles and the lower section of the top has two ribbon corset laced panels on either side. The sleeves are made from cotton with a wide lace flare from the elbow and they detach by means of buttons from the main body of the top. 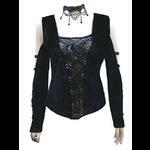 When worn with sleeves, the shoulder is cut away. 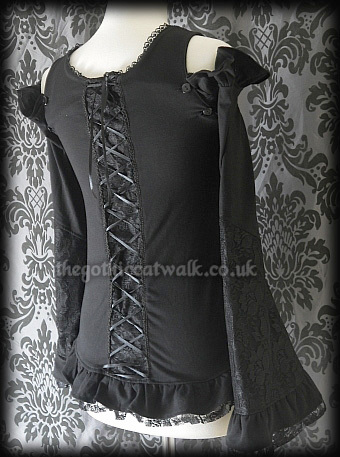 The hems and sleeve cuffs are trimmed with ruffled black cotton and lace and the neckline is edged with pretty narrow lace. The centre back has a ribbon laced panel. 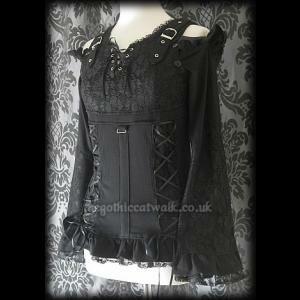 Loads of detail in this lovely top. 100% cotton. Cool machine wash at 30 deg C.
Bust: 32" - 34" Length: 25"
Bust: 34" - 36" Length: 25"
Bust: 36" - 38" Length: 25"